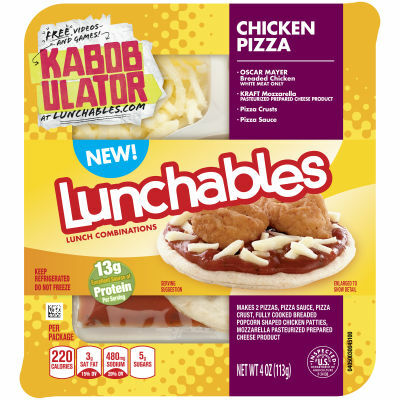 Lunchtime gets mixed up when kids get to combine two favorites with Lunchables Chicken Pizza. Oscar Mayer Breaded Chicken Nuggets made with white meat only with all the good pizza stuff like KRAFT Mozzarella cheese, pizza sauce and pizza crust made with whole grain. A delicious, convenient, and fun option for school, picnics, or on-the-go lunch. 13 grams of protein. Each tray is 220 calories.